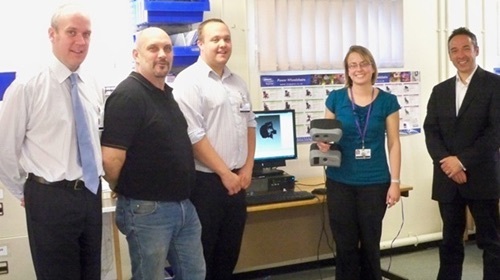 The Rehabilitation Unit and the Maxillofacial Laboratory at the Morrison Hospital in Wales have joined forces and now both use the Artec MH scanner to solve two very different problems. The Rehabilitation Unit initially purchased the scanner to design customized wheelchair cushions. A bean-bag imprint of a patients’ body was scanned and a more comfortable wheelchair cushion was made. This was the sole purpose of the scanner in the hospital, until Peter Evans, a consultant at the Maxillofacial Laboratory, approached the Rehabilitation Unit. He wanted to see whether the scanner can be used in the field of corrective body support. As the hospital also provides prosthesis treatment, Peter initially tested the MH scanner to scan parts of the body and create custom fitting prosthetics. The laboratory plans to use the scanner for maxillofacial applications in future. Previously plaster casts were used, to get an imprint of the body part that needed a prosthetic. According to Mr. Evans, «this application of plaster was messy, took a long time to dry and could make the patient feel uncomfortable or even claustrophobic». Moreover, due to the material’s weight, cast results often lacked accuracy. An Artec MH scanner facilitates limb shape acquisition and makes this process a matter of minutes. With the scanner being handheld, laboratory staff can easily capture the patient at every angle and increase prosthesis accuracy. «We can pick up information from a patient that wasn’t possible before, increasing accuracy and shortening treatment time», said Mr. Evans. The Morrison Hospital bought its Artec MH scanner from an authorized Artec reseller in the UK — Patrick Thorn&Co. To read more about Morrison Hospital in Wales, go to http://www.wales.nhs.uk/sitesplus/863/news/20360.